- Plating: Brass, Copper, Yellow zinc, Blue zinc, White zinc, Chrome, Nickel, Silver and Gold. We take pleasure to introduce ourselves as one of the renowned firms for providing the best-in-class range of Sheet Cutting Components. With our in-depth knowledge of this domain, we are actively engaged in offering an excellent quality assortment of Sheet Cutting Components. We offer an exclusive range of Laser Cutting Components, which is available in various dimensions and can be personalized as per the requirement of our valued clients.These are fabricated using best grade raw materials in compliance with industry standards.Our team of quality experts makes sure that our range is free from any defects and meets industry standards. We are offering to our valued customers a supreme quality range of Cutting Components .Laser cut components, sheet metal fabricated components and products. Customers can easily avail this from the market at reasonable prices. With the valuable assistance of a skilled team of professionals, we are offering an extensive range of Laser Cutting Components. 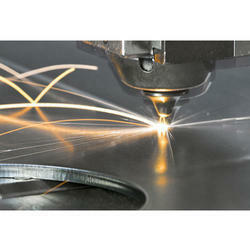 WE are in the field of sheet metal, laser cutting component as per the requirement of customers. A professionally managed company engaged in offering Cam Sheet Cutting Components that are fabricated in various sizes that exactly suits the industry's requirements. These are manufactured from high quality materials that ensures efficiency and durability. They are designed in compliance with the requirements of the clients and manufactured using latest technology machines. Keeping in mind the diverse necessities of our customers, we are occupied in providing an extensive series of Gas Cutting Component. We also provide Manual Profile Cutting Components from plates in Stainless Steel, Mild Steel, Carbon Steel, BQ etc. These produce high quality and precisely cut profiles with accurate dimensions. These are offered by us in various ranges and dimensions as desired by the clients. We offer these at industry leading prices. We are offering Laser Cutting Components as per customers requirements and designs. We assure you prompt delivery of components as per customers requirements. We also assure you that you shall be more than satisfied to do business with us.